Locate specific shapes and replace them with another. 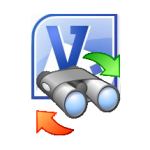 For Visio 2007 and 2010 32-bit versions. Try it FREE for 10 days... click Download Sample. In the real world, one type of object is often replaced by another for various reasons. When an object appears many times in a Visio drawing, Search and Replace will locate those multiple instances and automatically replace them with a new choice. The Search and Replace window is hosted in a modeless Visio anchored window. This anchored window can either dock, float, or even auto-hide and rollback to save you precious screen space. You can even combine the Search and Replace window with other Visio windows, such as the Custom Properties or the VisiPad windows, to create a single tabbed interface for all your data needs. Search and Replace has extensive filter criteria that enable you to find exactly the right shape. You can search through shape names, master names, and even text in a shape. Replacing shapes with Search and Replace is very simple. The Replace Options dialog enables you to choose what actions to take during a replacement. You can keep various aspects of the original shape's ShapeSheet sections, retain its text, resize the new shape to the original shape's size, and even choose whether or not to retain glue with other shapes. Easily copies any characteristics from one shape to others. For Visio 2007 and 2010 32-bit versions. Try it FREE for 10 days... click Download Sample. Reduce your Visio file sizes by automatically cleaning out unused masters in batch mode.For Visio 2007 and 2010 32-bit versions. Try it FREE for 10 days... click Download Sample.